Serum: The Image Skincare Iluma Intense Lightening Serum is a lightweight, oil-free serum that treats skin discolorations and redness. The blend of botanical lighteners, vitamin C and grape seed extract gently reduce inflammation. Serum(s): The Peter Thomas Roth Professional 3% Retinoid Plus is an overnight treatment to improve the look of fine lines and wrinkles and even skintone. Caffeine enhances penetration to deliver retinoid more effectively into the skin’s surface while a buffering complex of SymCalmin, SymSitive® 1609, allantoin, and bisabolol soothes and helps prevent the stinging and burning commonly experienced with retinoid usage—eliminating irritation. 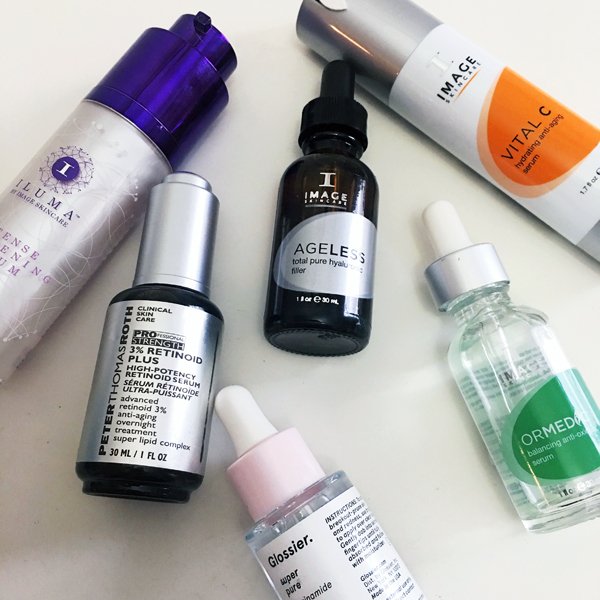 A second anti-aging serum to have on hand at the first sign of wrinkles (heaven forbid!) is Image Skincare’s Ageless Total Pure Hyaluronic Filler which plumps and fills lines with concentrated botanical-derived hyaluronic acid, infused with an apricot essential oil, Vitamin B5 and potent anti-oxidant Vitamin E.
Serum: To calm breakout-prone skin and redness, use Glossier’s Super Pure Serum filled with Zinc PCA to penetrate pores to clear out impurities and minimize sebum overproduction and Vitamin B3 to sooth the source of redness. Serum: To add moisture to your skin, pat on Image Skincare Ormedic Balancing Antioxidant Serum filled with botanical lactic acid serum infused with organic Japanese green tea, polyphenols and a copper-complex peptide to balance your skin from within and restore its ideal moisture level. Serum: If you have dual concerns of drynesss and wrinkles, turn to Vital C Hydrating Anti-Aging Serum which uses Vitain C to soothe the visible effects of environmentally damaged skin, Vitamins A, E and highly potent anti-oxidants to nourish the skin to create a healthy, youthful glow.